Obnam is a free, open source backup utility. It is an easy to install and secure application which is used to backup your system and sync the backed up data to remove computer. You can save your critical backup to your local hard disk or can move it to any remote computer for the sake of better security. It is a lightweight utility and runs extremely fast. You don’t need to worry about incremental or full backup copies of your data, this tool generates snapshots of your data and every snapshot contains your complete data. It provides data de-duplication and encrypted backup features. Let’s see how we can install it on Ubuntu Linux 15.04 operating system. First of all launch your system terminal and run following command to add PPA for Obnam to your APT manager. Once PPA has been added, run following command to update your package manager. Run following command to install obnam. Congratulations, obnam has been installed successfully now. Run following command to see manual for obnam. In order to install Obnam on Centos operating system, launch your system terminal and run following command to install Epel repositories. Once done, run following command to install Obnam. Here are some of the useful Obnam commands. Run following command to backup your data using obnam. You can find more details about different commands on Obnam manual. Obnam is a simple, yet powerful tool. It is lightweight utility and does not contain any graphical user interface. 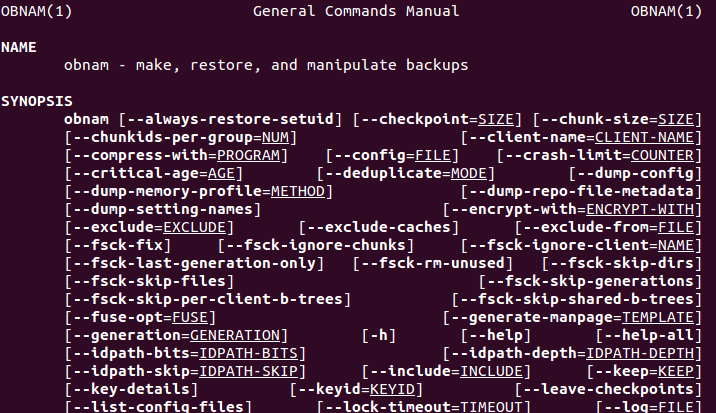 Everything is done via command line and is super fast. It comes with advanced push and pull features too which makes retrieving and pushing data simpler.